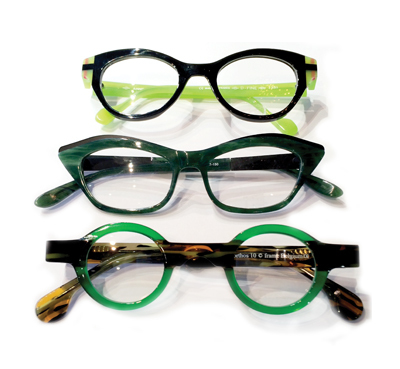 Be eye-catching for St. Patrick's Day in these Anne et Valentin, Francis Klein or Theo glasses. All three collections at Art & Eyes. Others will be green with envy when they see you sporting these adorable Sondra Roberts clutches, complements of Feet First. You'll have the luck of the Irish wherever you go this St. Patrick's Day with the Re-Mix Cloche Heel! This mint green patterned scarf is light-weight and the perfect accessory to avoid being pinched on St. Patrick's Day! Our Lucky St. Patty's Day outfit: Elie Tahari Sur Jacket, Elie Tahari. Denver Blouse and DL1961 Florence Instasclup Skinny Jeans. Have a drink on us! NOLA Couture glassware makes the perfect addition for your St. Patrick's Day celebration! Welcome the warmer weather with our new spring lineup. Shop online or in-store on Magazine Street. The Kasia is the perfect peep-toe bootie to accent your favorite trending look. This style features cutouts and a side zip detail. A cushioned footbed adds all day comfort. Functional and Fashionable! Mycra Pac hooded rain coat with matching tote. This jacket comes in three lengths and is available at all Ballin's locations. Celebrating Saint Patrick's Day in New Orleans? Lucky for you, we've four Hampton Inn & Suites locations to pick from. Beyond Yoga Spacedye Highwasited Leggings with optional stirrup. Featuring an elastic-free waist so you never create a muffin top. This silk abstract print shirt is a great addition to your wardrobe, whether it's a St. Patrick's day celebration or a lovely spring day. Dress version also available.